The ophthalmic lasers market is projected to reach USD 1,245.4 Million by 2021 from USD 970.2 Million in 2016, at a CAGR of 5.1%. The growth of the market can be attributed to the increasing prevalence of chronic disorders, rising geriatric population, increasing regulatory approvals, and increasing initiatives to prevent vision impairment. In the coming years, the ophthalmic lasers market is expected to witness the highest growth in the Asia-Pacific region. This can be attributed to factors such as high prevalence of ophthalmic disorders in several APAC countries, introduction of initiatives for the prevention of blindness and treatment projects for various ophthalmic disorders, and rising geriatric population. North America accounted for the largest share of the global market. Growth in the North American market is primarily driven by the increasing prevalence of ophthalmic disorders, rising prevalence of chronic diseases, and increasing regulatory approvals. This report segments the ophthalmic lasers market based on product types, applications, end users, and regions. On the basis of product type, the market is segmented into femtosecond lasers, excimer lasers, Nd:YAG lasers, diode lasers, and other lasers. On the basis of applications, the market is segmented into refractive error correction, cataract removal, glaucoma treatment, diabetic retinopathy treatment, age-related macular degeneration treatment (AMD), and other applications. The femtosecond lasers segment is expected to account for the largest share of the global market and is projected to grow at the highest CAGR during the forecast period. This can be attributed to factors such as increasing prevalence of refractive errors and cataract, technological advancements in femtosecond lasers, expanding applications of femtosecond lasers, and increasing regulatory approvals. The refractive error correction segment is expected to command the largest share of the global ophthalmic lasers market, by application, in 2016. This can be attributed to the increasing incidence of refractive errors and better clinical outcomes due to technological advancements in ophthalmic lasers. However, the cataract removal segment is projected to grow at the highest CAGR from 2016 to 2021. Automation of several steps performed manually during cataract surgery by femtosecond lasers is expected to augment the demand for ophthalmic lasers in this application. On the basis of end users, the ophthalmic lasers market is segmented into hospitals and clinics & ambulatory surgery centers (ASCs). The hospitals segment is projected to command the largest share of the global market, by end user. This can be attributed to factors such as the introduction of new technologies in hospitals and increasing number of hospitals in emerging economies. The key players in the market include Alcon Laboratories, Inc. (U.S.), Abbott Medical Optics, Inc. (U.S.), Carl Zeiss Meditec AG (Germany), Bausch & Lomb Incorporated (U.S.), Ellex Medical Lasers Limited (Australia), Topcon Corporation (Japan), Ziemer Ophthalmic Systems AG (Switzerland), IRIDEX Corporation (U.S.), NIDEK Co., Ltd. (Japan), and Lumenis Ltd. (Israel). The ophthalmic lasers market is projected to reach USD 1,245.4 Million by 2021 from USD 970.2 Million in 2016, at a CAGR of 5.1%. Increasing prevalence of ophthalmic disorders, rising prevalence of chronic disorders, rapid growth in geriatric population, and increasing regulatory approvals for ophthalmic lasers are expected to drive the growth of the market. The global ophthalmic lasers market is segmented on the basis of product types, applications, end users, and regions. On the basis of product type, the global market is segmented into femtosecond lasers, excimer lasers, Nd:YAG lasers, diode lasers, and other lasers. The femtosecond lasers segment is expected to account for the largest share of the market and is projected to grow at the highest CAGR during the forecast period. This can be attributed to factors such as increasing prevalence of ophthalmic disorders, technological advancements, increasing regulatory approvals, and expanding applications of femtosecond lasers. On the basis of applications, the market is segmented into refractive error correction, cataract removal, glaucoma treatment, diabetic retinopathy treatment, AMD treatment, and other applications. In 2016, the refractive error correction segment is expected to account for the largest share of the global market; whereas, the cataract removal segment is expected to grow at the highest CAGR. On the basis of end users, the market is segmented into hospitals and clinics & ambulatory surgery centers (ASCs). The clinics & ambulatory surgery centers segment is projected to grow at the highest CAGR, primarily due to the increasing number of clinics in emerging economies such as China and India and increasing government initiatives for the development of ambulatory surgery centers. 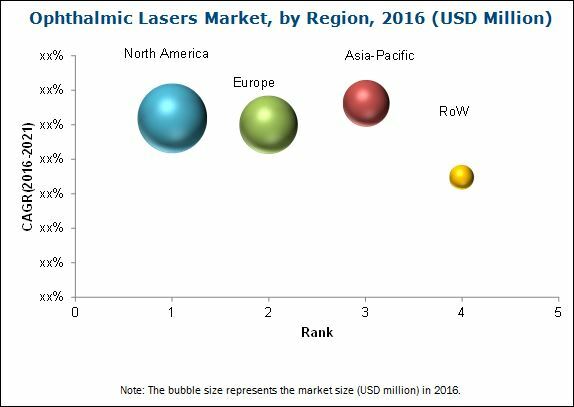 The ophthalmic lasers market is segmented into four major regions, namely, North America, Europe, Asia-Pacific, and the Rest of the World (RoW). Among these regional segments, North America is expected to account for the largest share of the global market. However, the Asia-Pacific region is expected to grow at the highest CAGR during the forecast period. The high growth in this regional segment can be attributed to factors such as high prevalence of ophthalmic disorders, introduction of initiatives for the prevention of blindness and treatment projects for various ophthalmic disorders, and rising aging population. Alcon Laboratories, Inc. (U.S.), Abbott Medical Optics, Inc. (U.S.), Carl Zeiss Meditec AG (Germany), Bausch & Lomb Incorporated (U.S.), Ellex Medical Lasers Limited (Australia), Topcon Corporation (Japan), Ziemer Ophthalmic Systems AG (Switzerland), IRIDEX Corporation (U.S.), NIDEK Co., Ltd. (Japan), and Lumenis Ltd. (Israel) are some of the key players in the ophthalmic lasers market. 9.2.1.1 Rising Prevalence of Ophthalmic Disorders in the U.S.
9.2.1.3 Increasing Regulatory Approvals in the U.S.
10.2.3 Abbott Medical Optics, Inc. Figure 33 Company Snapshot: Valeant Pharmaceuticals International, Inc.